That's a curious revision. It would potentially make for slower RAM. Although, I don't see any level conversion for the RAM in the VA 0 schematics, anyway. sestrenexsis wrote: Some thorough research hinted me towards voltage ripple being the issue. When I measure using the multimeter when reading a CD, the voltage always fluctuates between like 4.98 and 5.1. The PSU I got seems to be very stable (measuring that alone gave me a rock solid 5v), so my guess is that something in the middle is making it fluctuate, and therefore freeze. Where are you measuring that fluctuation in voltage? In terms of ripple voltages, that's still only 2.4% of the target output. That should be more than tolerable by the system, but you could have transients that you wouldn't be able to see without an oscilloscope. In all likelihood, that's just the inductive load of the motor, but you could use the AC voltage setting on the DMM, if it has one, and use the MAX function (if available) to try to catch any potential spikes. Depending on the DMM, however, I don't think I would put a whole lot of stock in the results. You may be introducing some power losses, and/or ground loops with your workaround, though. 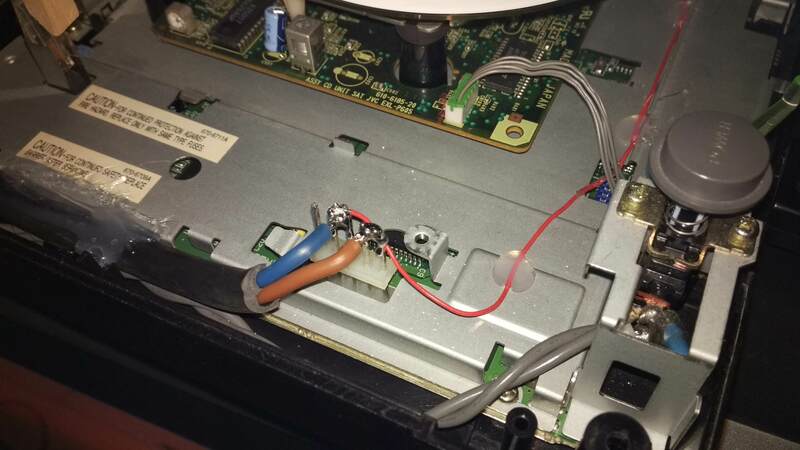 It could be worth putting the output capacitor back into the PSU, or checking the input capacitors on the main PCB. sestrenexsis wrote: I would've loved to be able to get a replacement transformer by the way, but I have yet to come across one on any page. The main characteristic that would be important is the turns ratio. It's only a hunch, but I have seen that PSU transformer marked with 100V (assume RMS transformer input), and if the output should be 9V RMS, the turns ratio would be approximately 10:1. The other things to make sure of would be that the characteristic impedance is suitable for 50Hz, and the core material would likely need to be a laminated steel core, to minimize eddy current losses. The passthrough was the culprit all this time! For some reason beyond my knowledge, the original board created the ripple. I know such little variation should be tolerable, but I've read that VA9 PAL boards (the one I have) is one of the most sensitive when it comes to voltage. I'm not gonna bother to inspect the board further. All I had to do was solder cables from the PSU directly to the pin header, including the modchip. I used the thickest cable I could find to prevent further issues. There is now next to no fluctuation, and the console (so far) hasn't done anything strange. At the moment it loads every game I throw at it. One thing I had to do is leave out the Power button, because apparently it did cause some ripple too. When fed 220V AC (when the original board was working) it was irrelevant, but now that it receives 5V DC, any small change is important. Doesn't matter though, just that the console powers on automatically when plugged in. I can live with that. 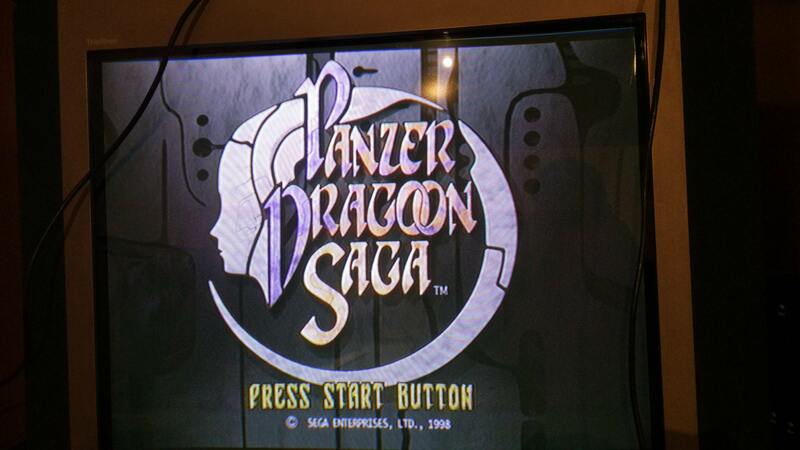 And here's a picture of it running Panzer Dragoon Saga! However, until I test more games, please don't mark this as solved. Glad you found a potential solution. sestrenexsis wrote: One thing I had to do is leave out the Power button, because apparently it did cause some ripple too. When fed 220V AC (when the original board was working) it was irrelevant, but now that it receives 5V DC, any small change is important. Doesn't matter though, just that the console powers on automatically when plugged in. I can live with that. Wire resistance is proportional to length, and inversely proportional to diameter. You might be able to get away with using the power button if you solder the return lead of the power supply directly to the push button N.O. pin, and use the shortest length possible of heavier gauge wire from the push button's com terminal, to the ground pin on the power block connector. This should minimize the "parasitic" property of the wire resistance. Maybe it's just easier leaving it as it is, though. Hmm sounds interesting, although I don't want it to suffer from any more issues. Yeah I think I'll just leave it as it is right now. after a long time testing, I have yet to notice any issues. The console lives on. Though, I'm now having a minor problem related to the video output, which I think I'll open another topic for. 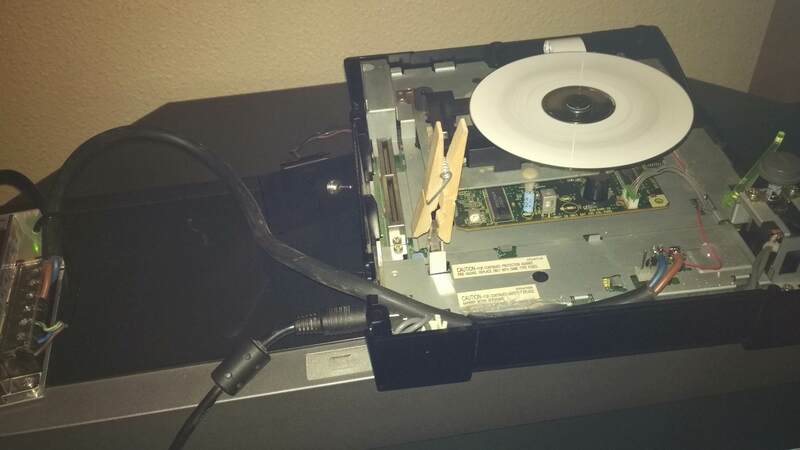 I've had issues where original systems with the original power boards did the exact same thing. Unfortunately I did not have the equipment to test for voltage spikes. The odd thing is that the issue is somewhere in the MOTHERBOARD. I could swap out every single component with ones from a flawless unit, and the board itself still crashed randomly. You say the issue is caused by voltage spikes? That would mean insufficient ripple filtering on the motherboard side, right? I noticed that after recapping the system, the problem occurred much less (and if I leave it running often, it gets fixed on its own).